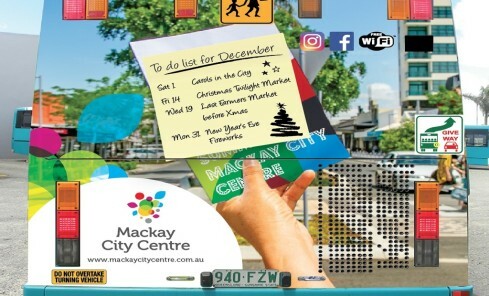 Eat, Drink, Shop, Culture, Heritage and Art are the words that can be seen around the suburbs of Mackay as the City Centre has taken to the streets advertising the City’s amazing offer available. The 18-week campaign which started in November is the start of our Summer in the City promotion. Along with two “super-side” bus adverts, there is a five-week full back of bus campaign, on ‘Things to do in December’. The vibrant, fresh look of the City Centre branding is sure to be noticed – so keep an eye out for the buses as they arrive at a bus stop near you! Make sure you listen to Star 101.9 in January and February to find out how to win our Summer in the City one of two $1,000 City Centre Shopping Vouchers. Or go to our Facebook page or Website for more details.